I don't mind black and white photography, but there are times when I find it maddening. 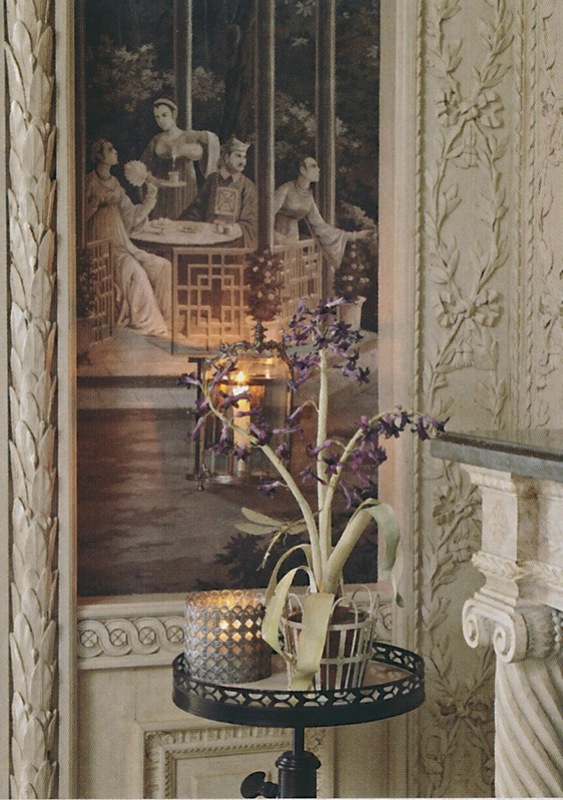 Take, for the example, the photos of this gem of a flower room, which was painted in trompe l'oeil. 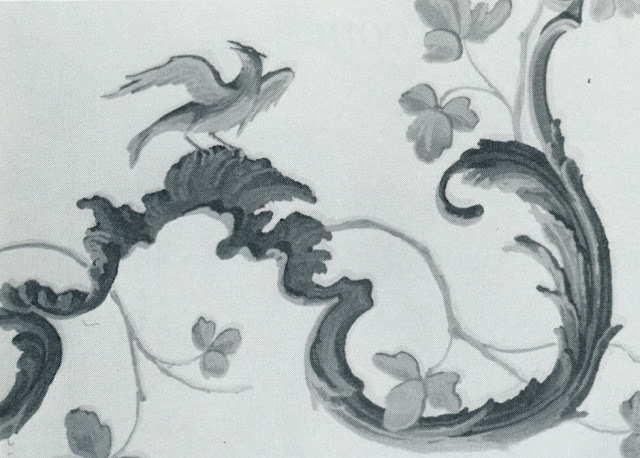 How can one truly appreciate trompe l'oeil paintwork without seeing its colors? 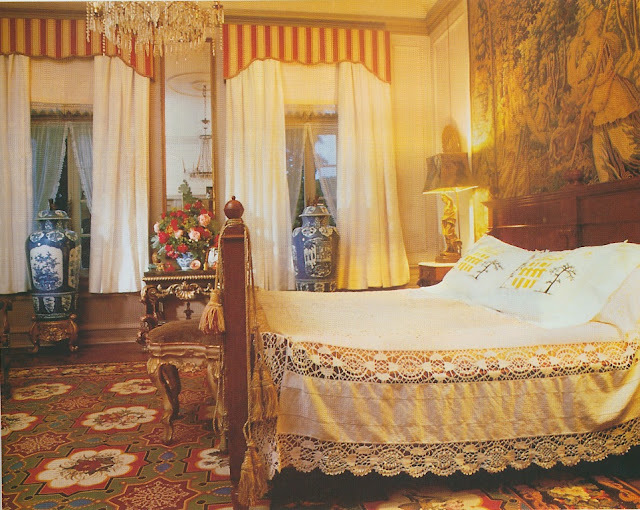 Despite these limitations, the photos, which appeared in Classical America IV , still manage to capture the room's immense charm. 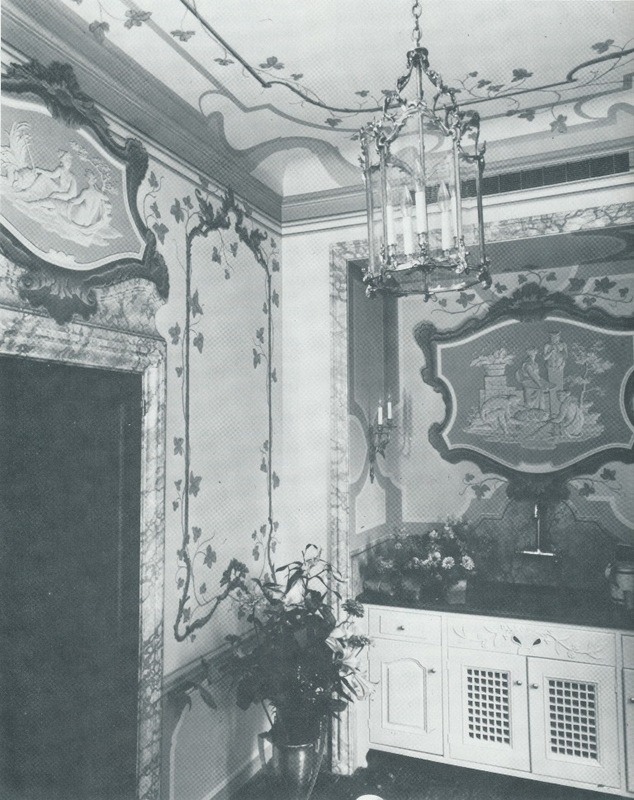 According to the accompanying text, the room, which was located off of a residential garden and used for flower arranging, was painted by decorative artist Hight Moore. 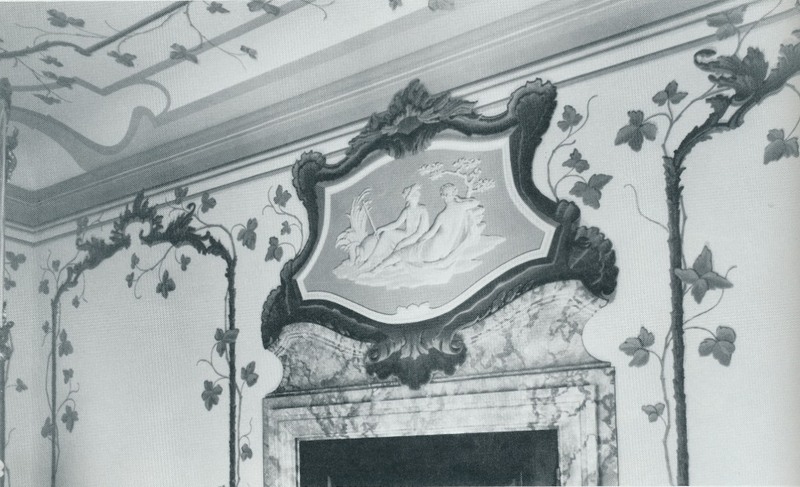 (No mention is made of where in America this room was located nor when Moore painted it.) 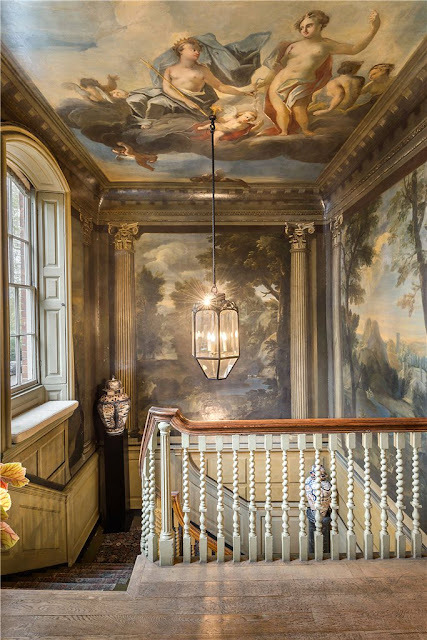 Together, the artist and the homeowner conceived a space where the Rococo style- or, at least, a trompe l'oeil version of it- runs rampant. Other than an existing door frame, chair rail, and single half-round molding at the ceiling, the architectural embellishments have been painted on by Moore. 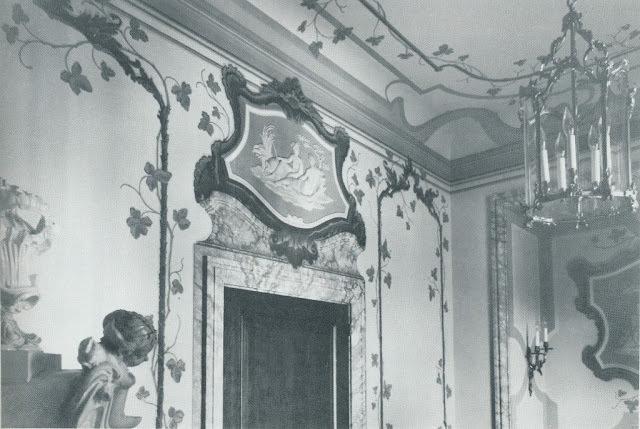 Against the white of the walls, the trompe l'oeil architectural details, i.e., the dado, cornice, ceiling panels, etc., are in a pale mauve, with the actual door frames and back splash of the sink in faux marbre of mottled lilac. The rocaille-and-vine motifs are in a strong green, as are the rocaille frames of the two reliefs, the one over the door and the other over the sink. The details of the reliefs are white, like the stove, against a soft terra cotta background which echoes the brick floor. 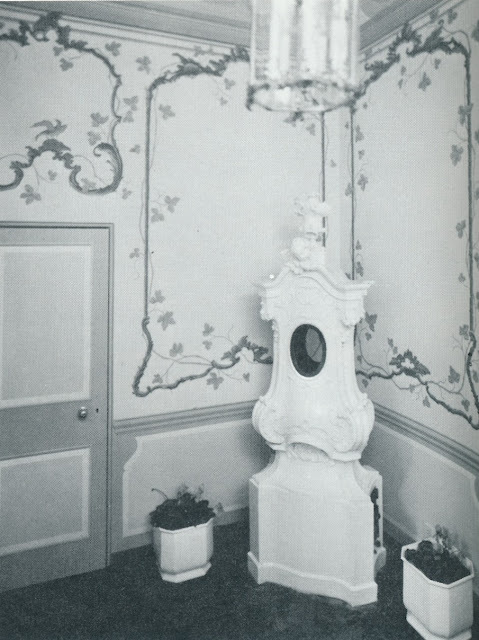 So there you have it- a flower room whose sense of fun and fantasy is evident, even when presented in black and white. 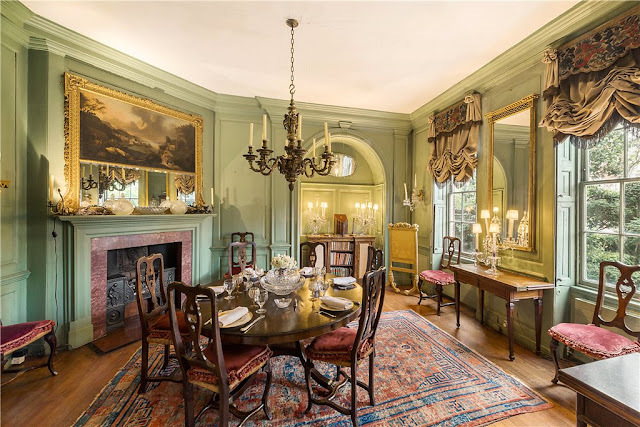 Speaking of Classic America, I hope you'll join me tomorrow night for an ICAA-sponsored lecture on classical architecture, which will be presented by Birmingham-based architect James Carter. The details can be found above, but for more information or to register, please visit the Southeast Chapter of the ICAA website. Thank you to the Scully & Scully catalogue for reminding me that the world hasn't completely gone to hell in hand basket. 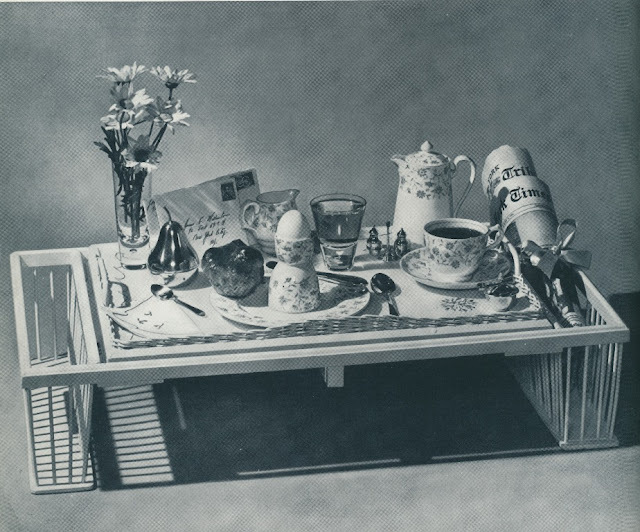 Its numerous pages filled with photos of folding bridge tables, hardboard place mats, wooden breakfast bed trays (similar to the one above), and other traditional niceties always bring me comfort, for they make me realize that some people in this world continue to appreciate such things. 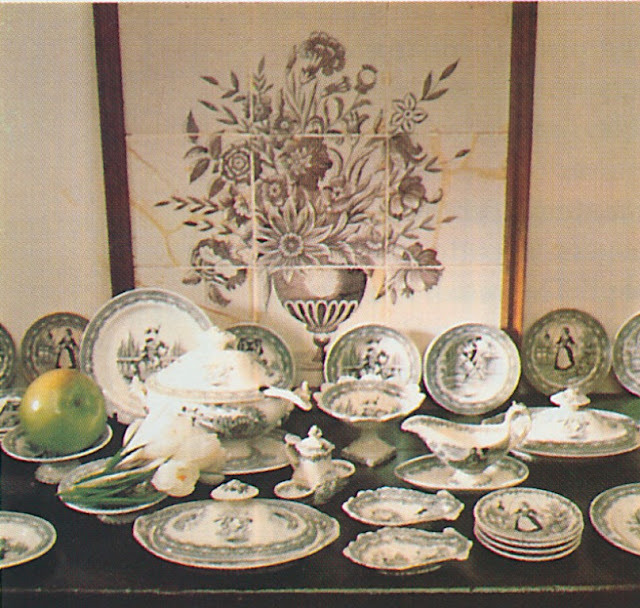 Although not a bride, I, too, have breakfast china (Porthault's Trèfles pattern), a large breakfast tray, and a set of breakfast tray linen, which consists of one mat and two napkins. 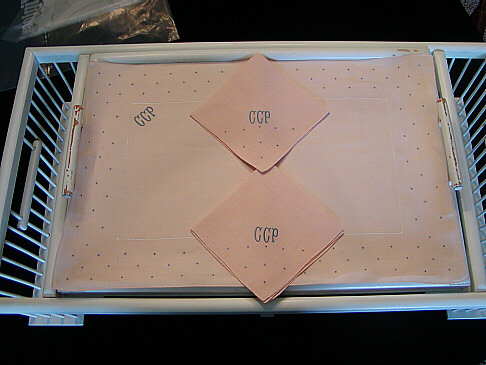 I wish that I could say I use these daily, but instead, it's more like a Sunday occurrence. If only my life were leisurely- and if I had staff- then perhaps my weekday breakfast repertory would be far more luxurious than it currently is. 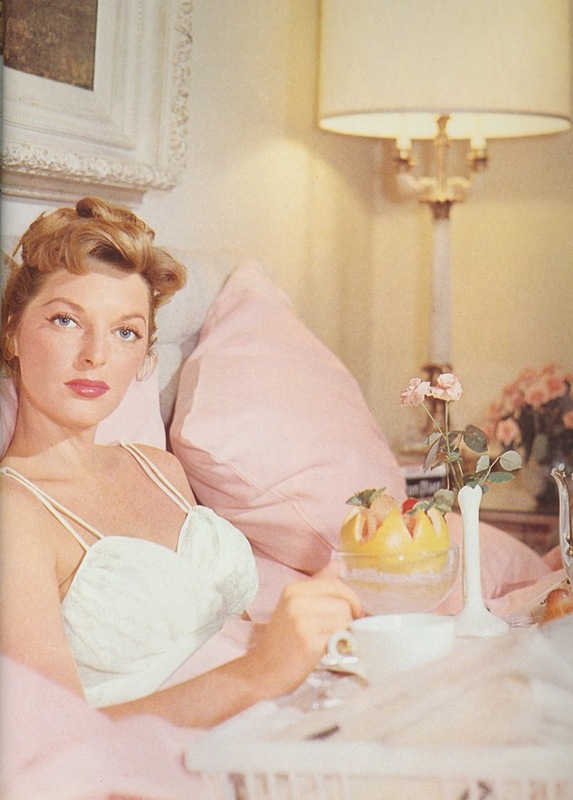 Singer and actress Julie London, photographed in bed with her breakfast tray by Slim Aarons. 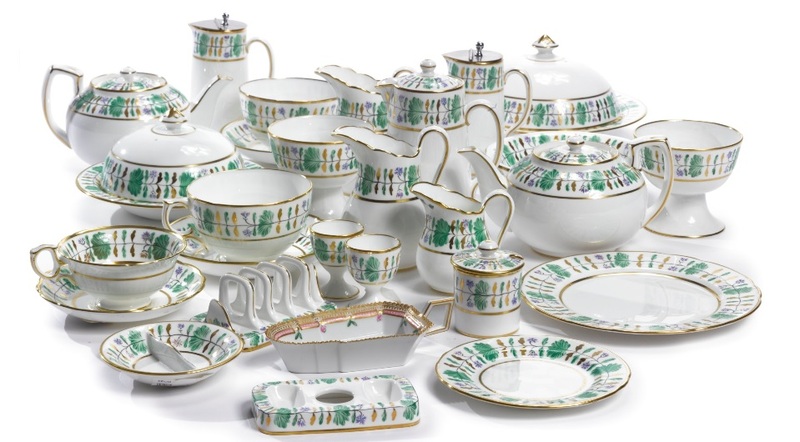 Truman Capote's Porthault breakfast set, sold at Bonhams in 2006. 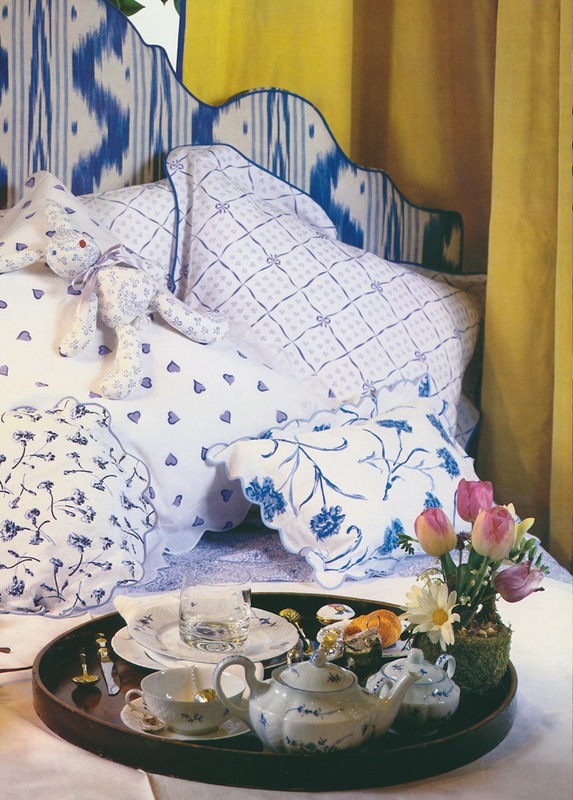 Mario Buatta created this dining-in-bed vignette for Tiffany. 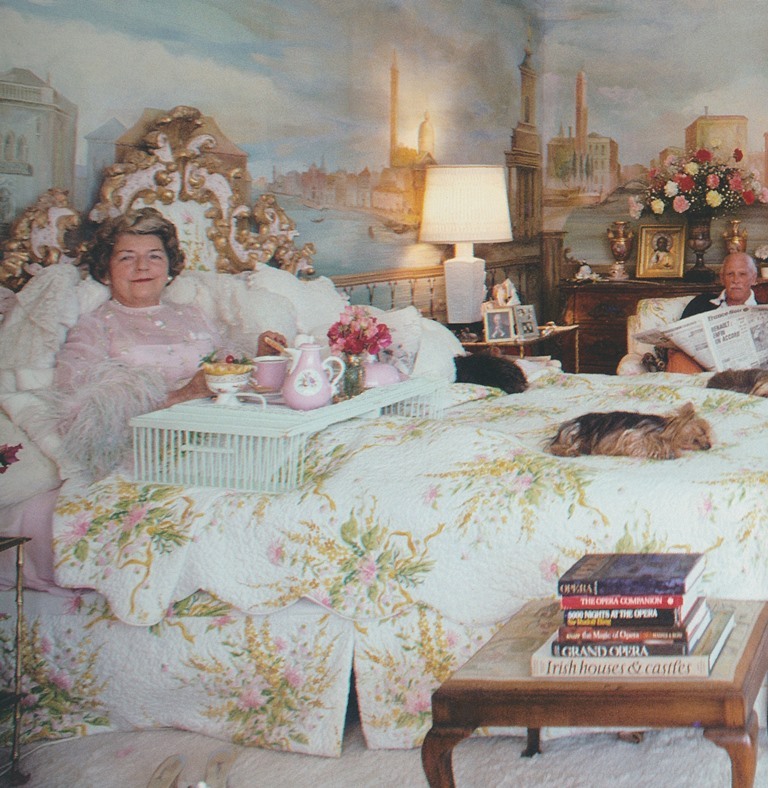 Another Slim Aarons' breakfast-in-bed photo, this one of Mrs. Saunderson of Montecito. Brooke Astor's breakfast china by Hammersley & Co., sold at Sotheby's in 2012. 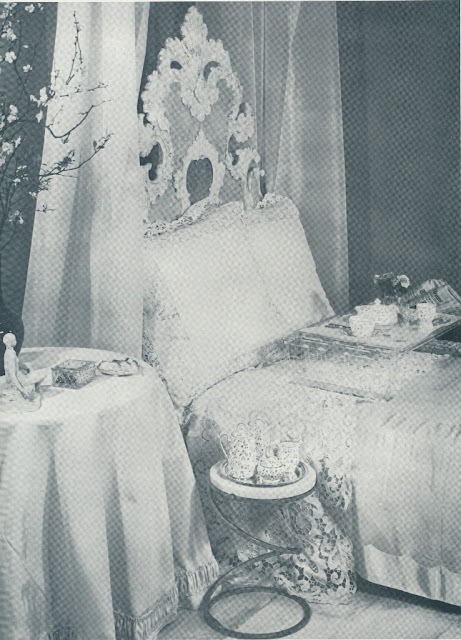 An elegant bed vignette, courtesy of Tiffany & Co.
A 1940 Léron linen ad, which shows their charming "Bouquet" table linen. 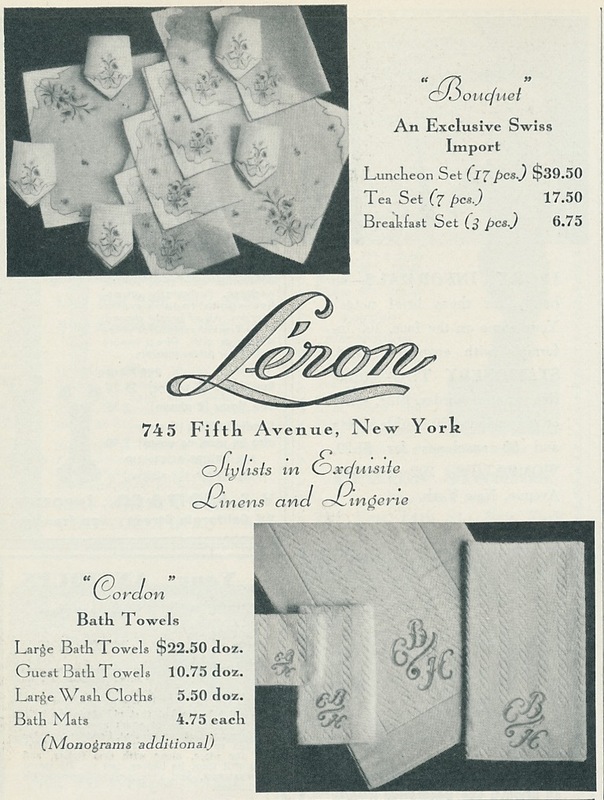 The linen was available in luncheon sets, tea sets, and breakfast sets. On Instagram, I have noticed that there are certain photos that seem to garner many "likes". Rooms with a traditional, European sensibility are popular, as are rooms painted in moody shades of brown, green, or blue. 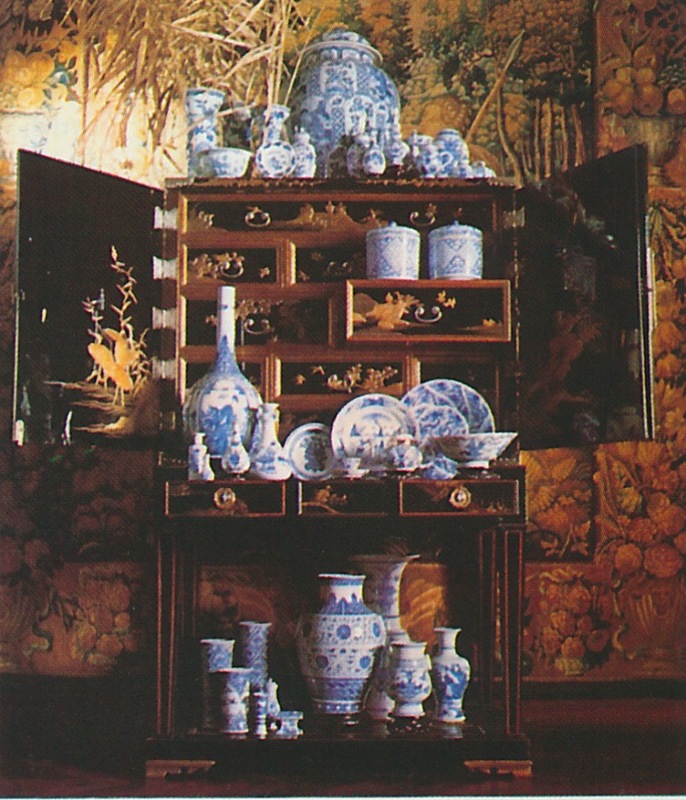 Photos of blue and white ceramics are always pleasers, especially when the blue and white is grouped en masse. 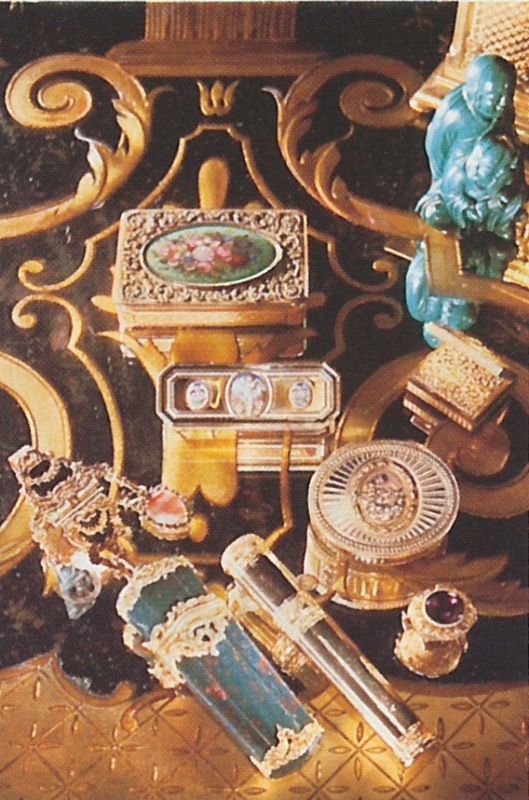 Detail photos of interesting collections displayed on table tops are sure to get hundreds of likes, as will nighttime photos that capture rooms bathed in pools of warm light. 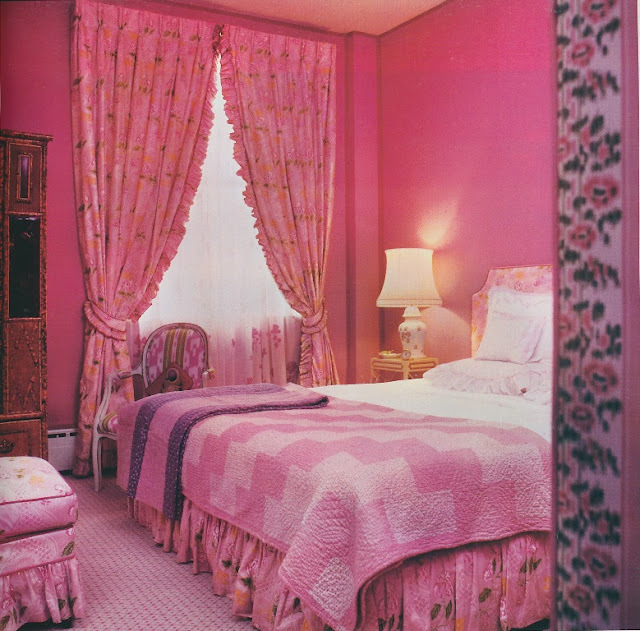 Of course, these are but a few of the types of photos that keep people coming back to Instagram seeking design inspiration. Traditional, elegant homes such as this one are the exception rather than the rule these days. 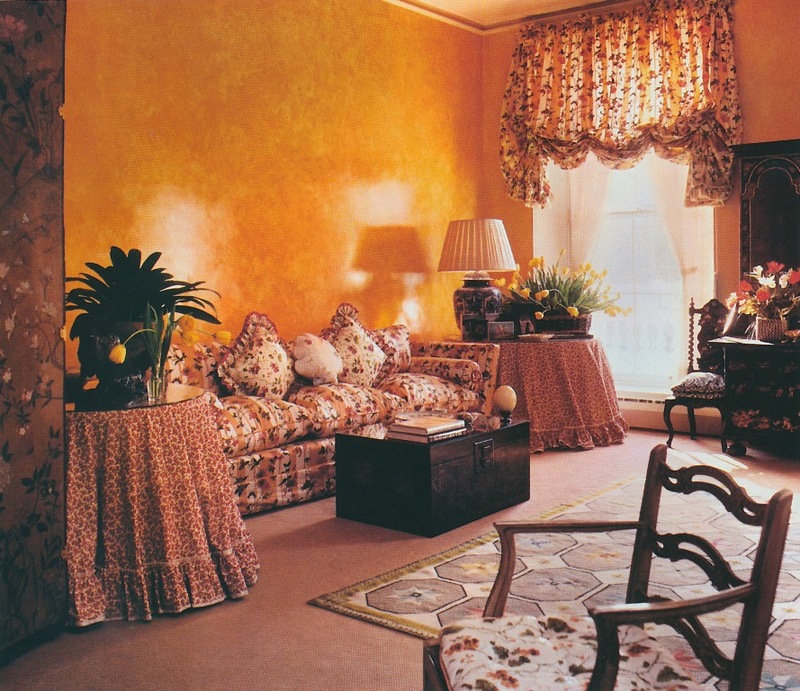 But thanks to Instagram, I'm finding that rarefied taste in décor not only still exists, it seems to be generating some excitement, too. 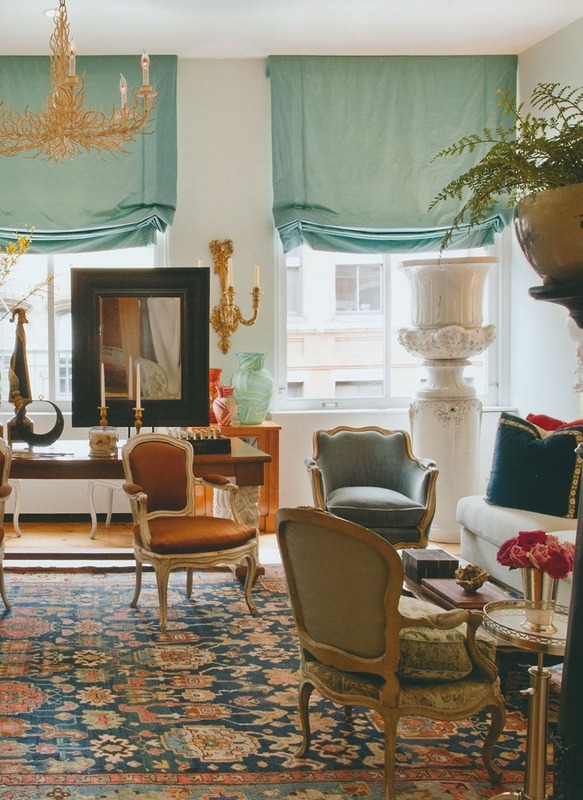 The couple's living room, which was brimming with well-chosen antiques. A Dutch Louis XIV cabinet, which held 17th- and 18th-century silver. 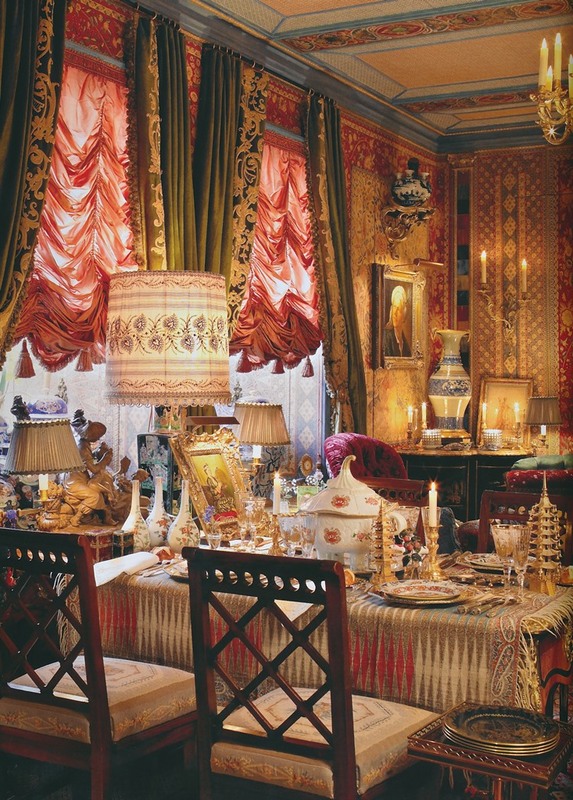 The couple's dining room, with its tooled and gilded leather-paneled walls. An 18th-century Japanese cabinet with blue and white porcelain. A collection of antique writing implements and boxes. Mrs. van der Ven's collection of miniature 19th-century dinnerware, which she began collecting as a child. 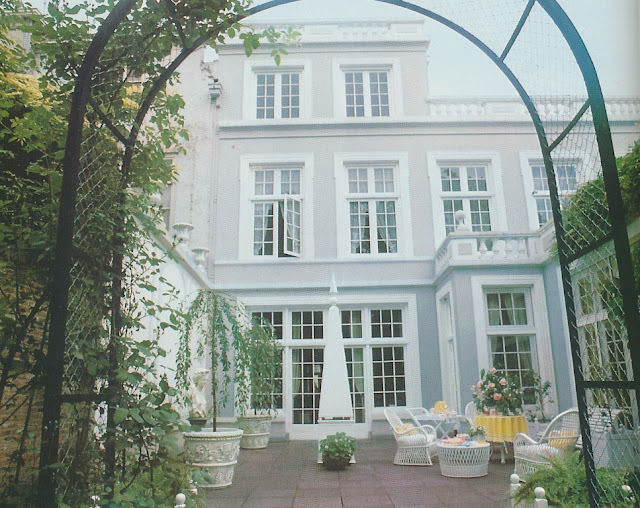 All photos from Architectural Digest, April 1981, Kees Hageman photographer. Next month, I will celebrate nine years of blogging, and I can hardly believe it. Back then, blogging was considered cutting-edge, but today, it's more like the éminence grise of the social media world. So much has changed since 2006, and yet, in a way, much has stayed the same. Nine years later and I'm still focusing my attention on those interiors and furnishings that have stood the test of time. Some of you who have been with me for the long haul might remember "The Classics" series that I wrote a number of years ago. 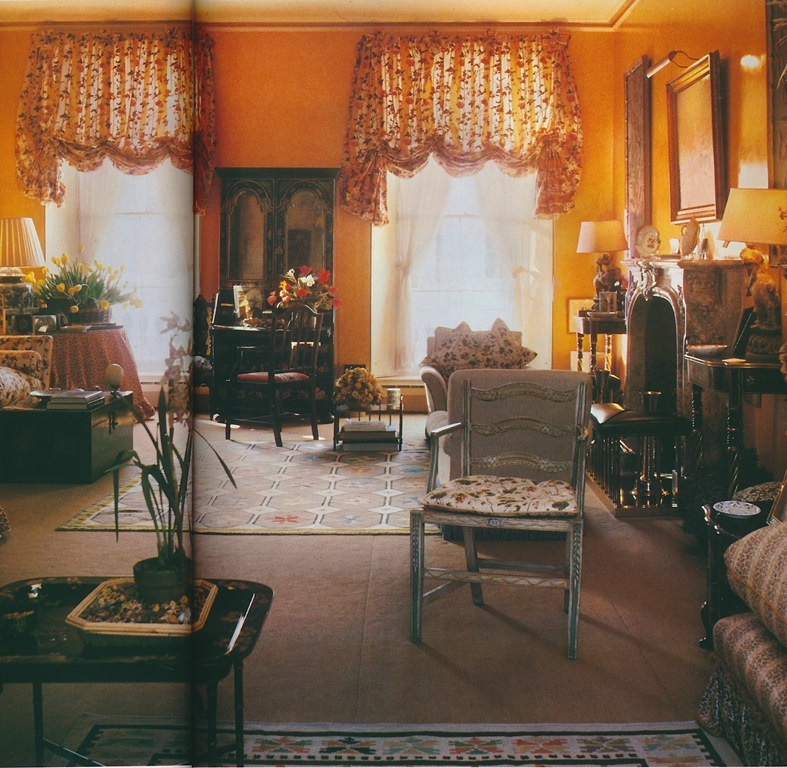 Each of the series' blog posts featured furnishings that I considered to be classic. 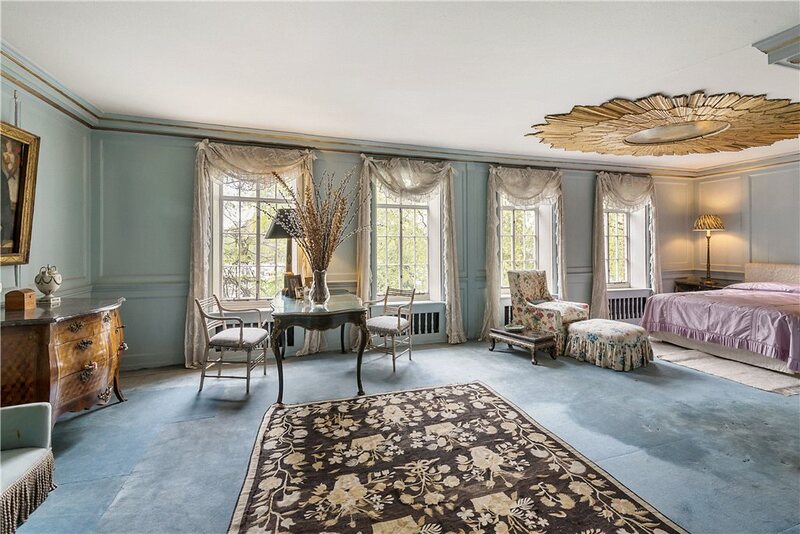 Think Porthault linen, Brunschwig's "Les Touches" fabric, and Billy Baldwin's slipper chair. (Little did I know back then that I would eventually develop this concept into a book, In with the Old.) But it dawned on me last week that I had never written about a piece of furniture that is most definitely a classic: the telescoping table. 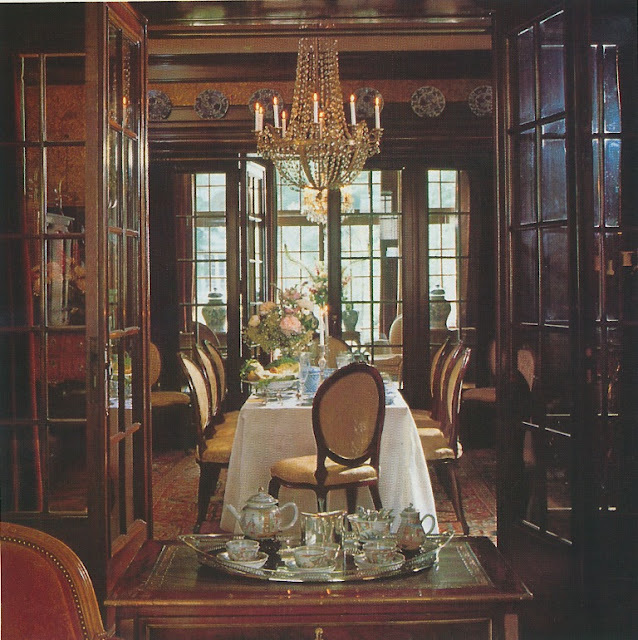 Look at the homes of Hubert de Givenchy, Howard Slatkin, and Alex Papachristidis, to name but a few, and you'll find at least one telescoping table, which is a small occasional table whose height can be adjusted thanks to a telescoping shaft. 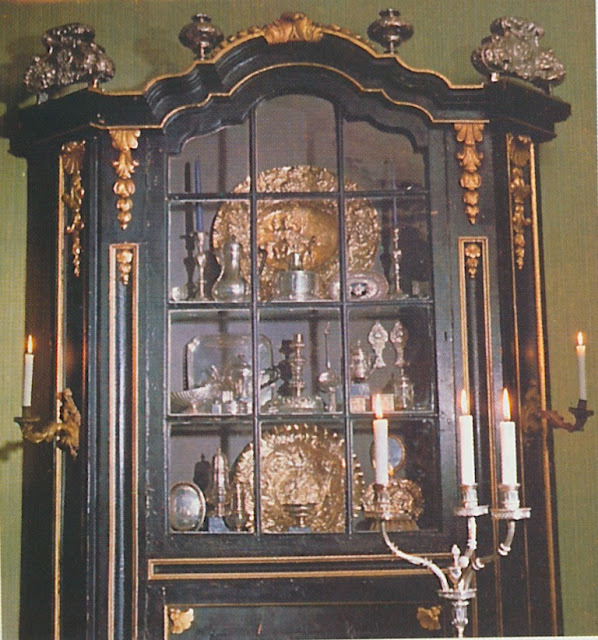 You often see these tables constructed in brass, although they are made in others metals. And although most owners seem drawn to round telescoping tables, you will find square versions in many a well-appointed home, too. 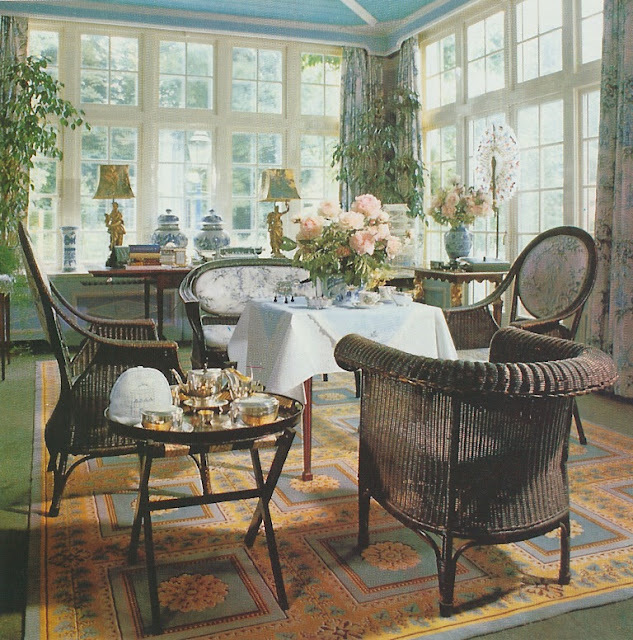 I have been told that those made by Maison Toulouse in the mid-twentieth-century are highly desirable, but also coveted is Matthews & Parker's nifty new version, which I recently saw in the Atlanta Brunschwig & Fils- Lee Jofa showroom. 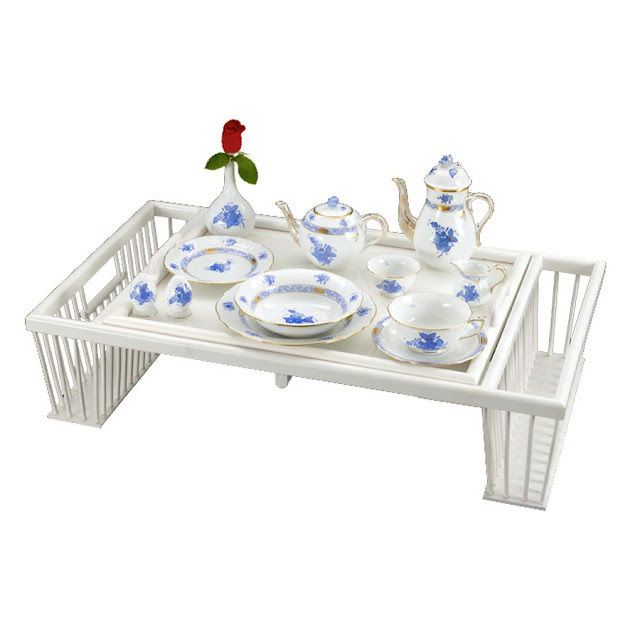 Seriously, what's not to love about a table that is handy, adjustable, and, most important, classically chic? And now, after having written this post, I covet a telescoping table even more than I did last week. I'm moving this table to the top of my wish list. 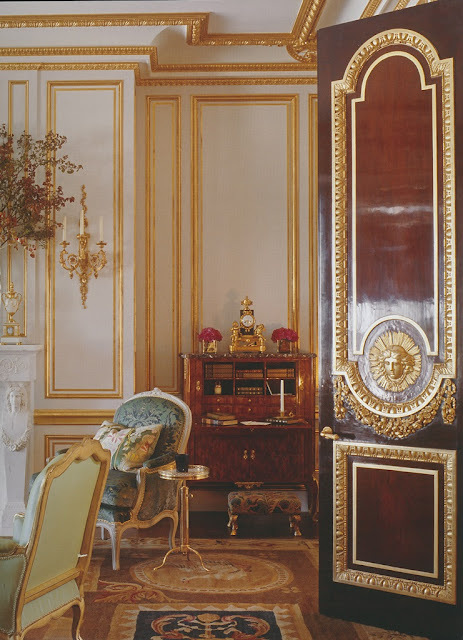 I always identify the brass telescoping table with Givenchy, who has quite a collection of them in his hôtel particulier in Paris. The table in the top photo also belongs to Givenchy. Howard Slatkin has a number of these tables in his home, including one that holds a candle and porcelain flowers and another that supports a stack of dinner plates. 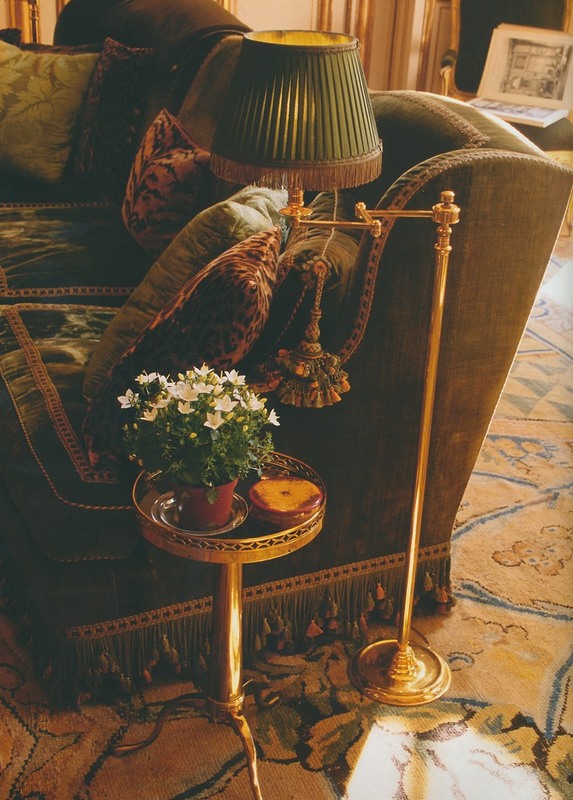 Brian McCarthy must be a fan, as he used this round telescoping table in a client's home. A square brass version in the former home of designer Alex Papachristidis. And here, in Robert Couturier's living room, a telescoping table holds a cheery bouquet of pink flowers. 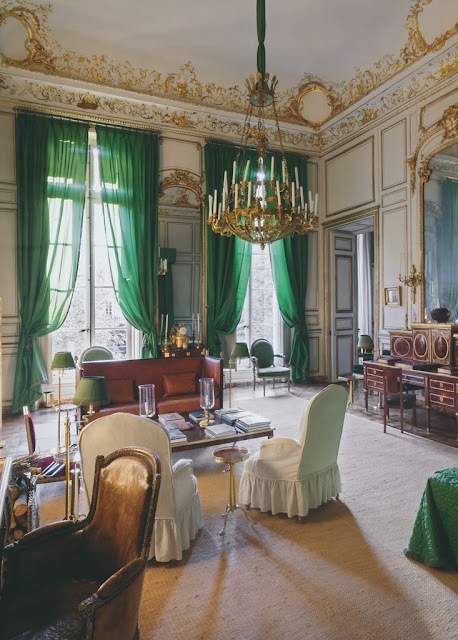 Photo #1: The Finest Houses Of Paris ; #2: Private Houses of France: Living with History ; #3 and #4: Fifth Avenue Style: A Designer's New York Apartment ; #5: Luminous Interiors: The Houses of Brian McCarthy ; #6: The Age of Elegance: Interiors by Alex Papachristidis ; #7: Robert Couturier: Designing Paradises . "I wanted the entire house to be glowing and warm, but above all, cozy. 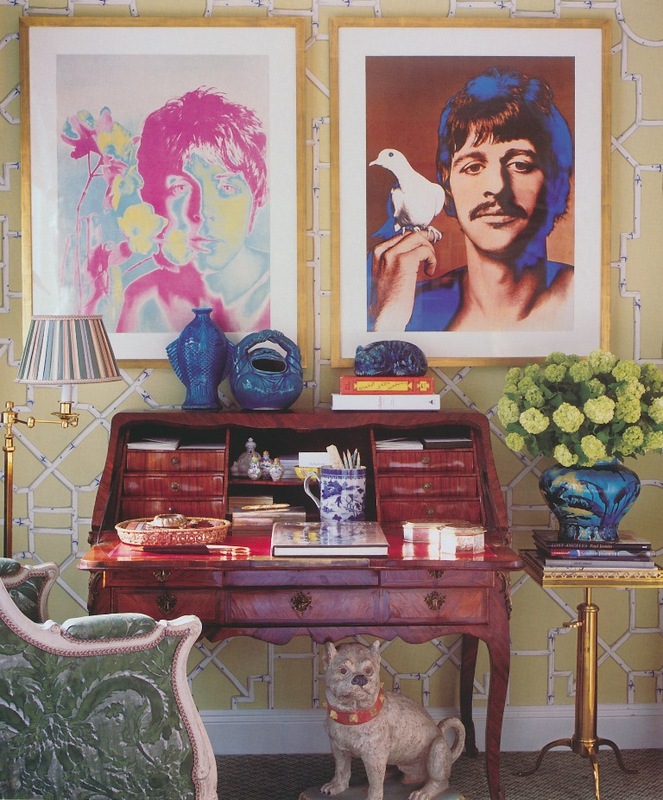 Color does this; so do pictures, stacks of books, music, photographs and flowers." So said Mrs. Anne Peto, an American whose London townhouse, seen here, was photographed for Architectural Digest in 1981. 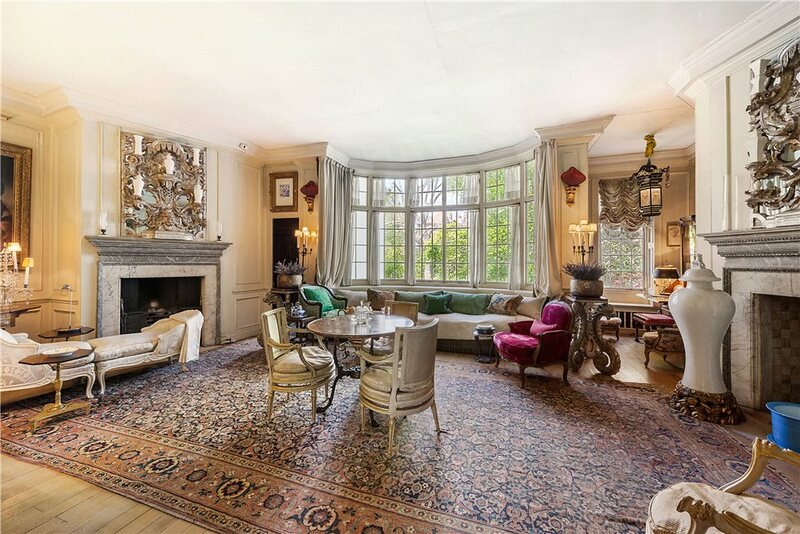 Indeed, her townhouse was cozy and warm in an English-country-house kind of way, a result of that always-pleasing mix of floral chintzes, dhurrie rugs, lacquered antiques, and painted furniture. 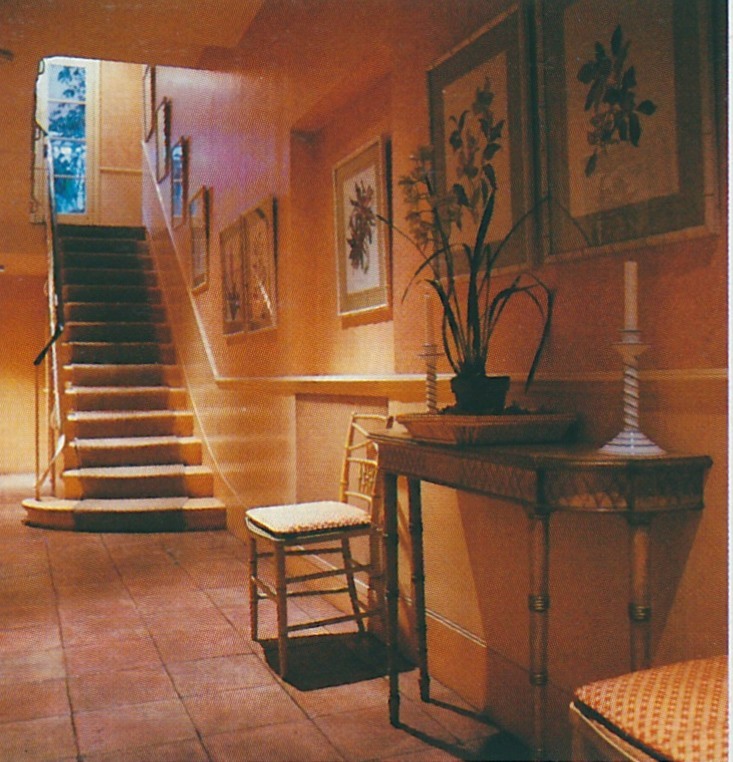 Those saturated hues- red, yellow, and pink- added to the warmth, a colorful antidote to those grey London days. 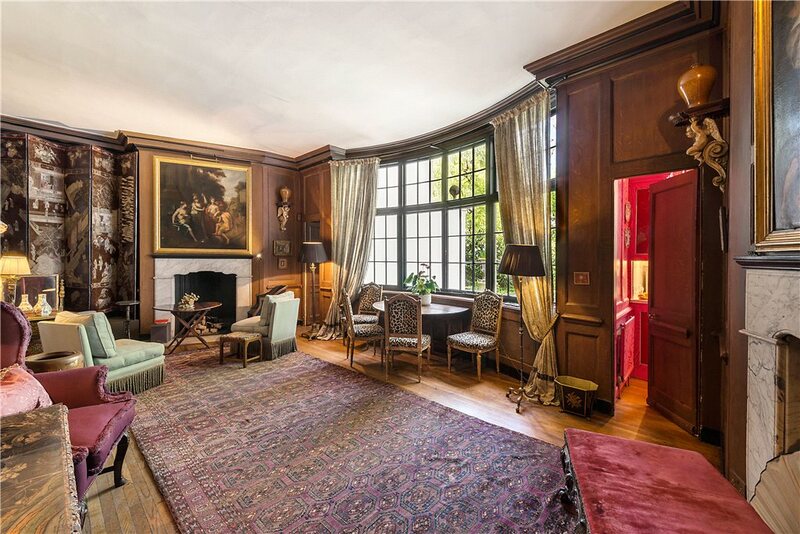 And those "glowing" walls, their luminosity achieved by glazing, injected notes of cosmopolitan dash, an urbane counterpoint to the surrounding coziness. 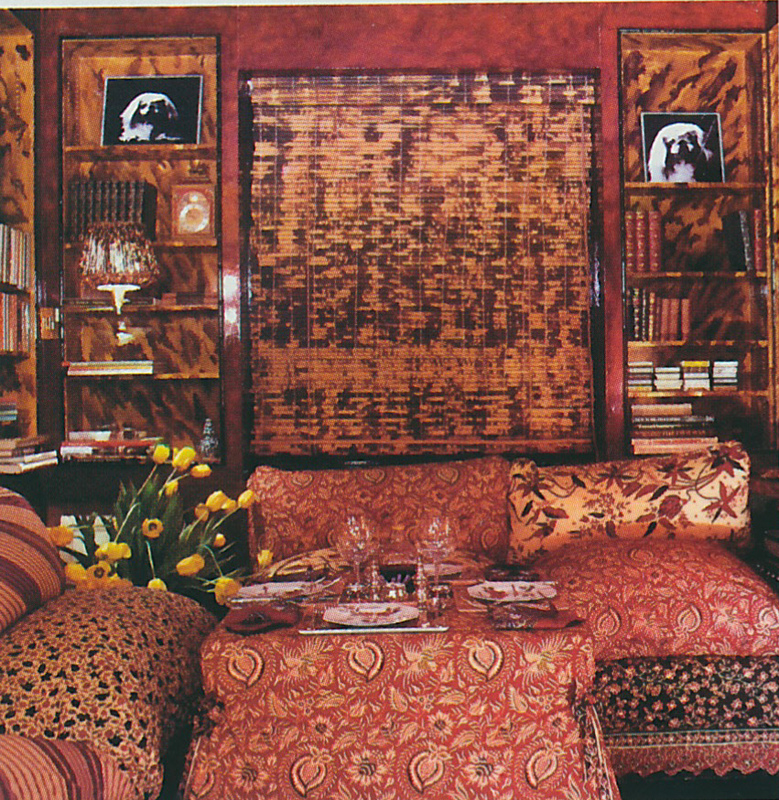 But the photo that really captured my attention is that of Mrs. Peto's fabulous red library, seen below, with its faux tortoise bookshelves, bamboo blinds, layer upon layer of pattern, and black and white dog photographs. (Note to self: hire a photographer to shoot black and white glamour shots of Alfie.) Of red rooms, the homeowner said, "Every house should have one!" I concur, especially if that red room looks like Mrs. Peto's library. What Do Michael Bloomberg, Victoria Press, and George Eliot Have in Common? Over the weekend, I read a New York Times article about the Cheyne Walk mansion that former New York mayor Michael Bloomberg recently purchased for £16 million pounds (around $25 million.) Wishing to learn more about the house, I clicked through to view the property's real estate listing. 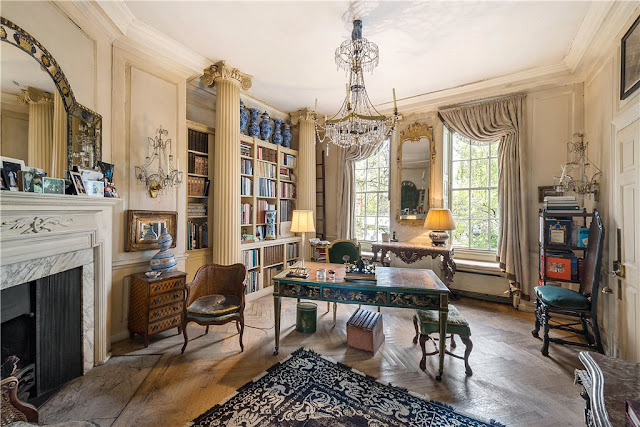 Although the London townhouse is better known as the long-ago home of writer George Eliot, I immediately recognized it as the residence of the late Victoria Press, the home's most recent owner who was profiled in T Magazine this Spring. 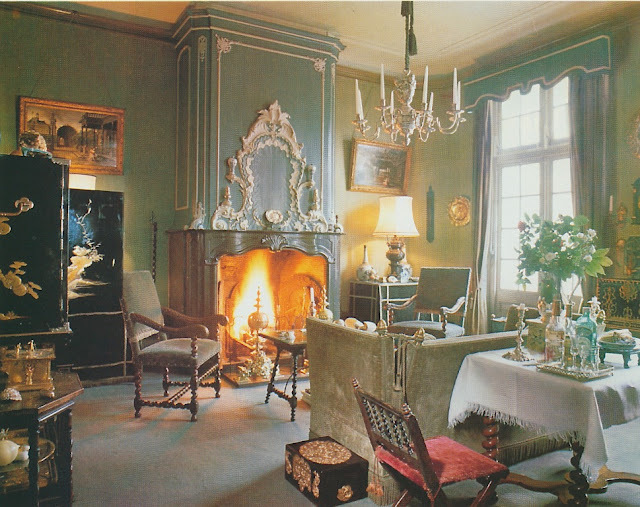 It was the listing photo of the home's drawing room, with its ornate, Blanc de Chine-adorned overmantel, that clued me in. 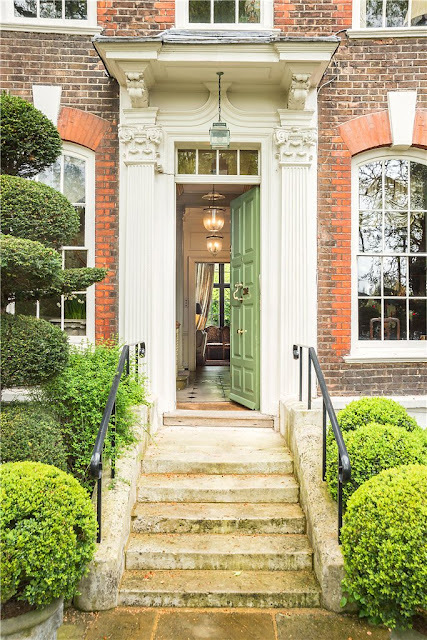 I have included some of the Strutt & Parker listing photos here, but for the full range plus specifics on the house, please visit the firm's website. 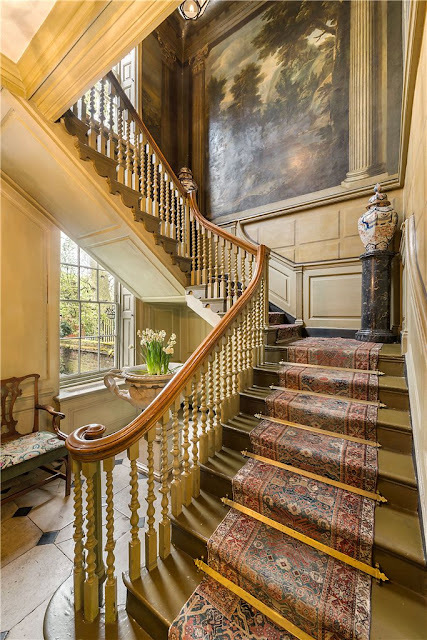 All photos from the website of Strutt & Parker.